Speaking with myself in the car while driving to work etc. And I warmly suggest you don’t ever give up such habits either – no matter how good your English becomes! The moment you stop actively working on your fluency, it will start stalling! The only exception is when you speak in English with others 24/7/365! … then you’re indeed fixed for life in terms of your oral English development. I mean – if you speak with other English speakers pretty much ALL THE TIME, you may not much time left in your life to speak with yourself, and after all – all that communication with other people is enough to exercise your mouth (which is your most important muscle – don’t you ever forget that!) and maintain your English fluency. If, on the other hand, your English conversations are quite limited to the same topics day in, day out, you should definitely top it up with some spoken practice with yourself – or else you’re running the risk of stalling your fluency and not making any progress at all. If your English conversations are very few and far between, you simply need self-practice! Let’s say for argument’s sake, that you work in a fast food restaurant. You can service people at the till, take orders and communicate with your colleagues in the kitchen, and your spoken English skills are quite strong in those areas. When you visit institutions such as banks, recruitment agencies or any other similar establishment, your spoken language wouldn’t be adequate to communicate with people in those settings, so if you want to stand a chance to better your life (get a better job, get a promotion, have a buzzing social life etc.) you simply have to TRAIN YOURSELF to speak well in English by imagining yourself in those situations. What about me? Isn’t my work environment sufficient to maintain my English fluency? Yes, I do work in a team consisting of native English speakers. Yes, I only speak in English at work. Yes, I communicate with other department managers on a regular basis. In theory, it should be enough to maintain my fluency and ensure a constant development of my English fluency. In reality though, it doesn’t happen that way. For one thing, my conversations with other people are quite routine ones – I have to talk about pretty much the same things all the time. Secondly – those conversations don’t occur often enough to ensure constant development of my fluency and ability to say new things all the time. Our standards increase all the time! There are folks who don’t desire much in their lives. Thousands of foreign English speakers are happy to move to an English speaking country, find ANY job they can, and just stay there for the rest of their lives while enjoying the simple pleasures of life on the days off – a few drinks with friends, a nice movie, maybe doing some shooting on the gaming console. It’s just that I’ve always been the type of person who wants more, and I just can’t settle with what I have – whether it’s my personal development, my finances or my career. And I’m pretty sure you’re the same type of person – otherwise you wouldn’t be reading this blog trying to figure out how to improve your English fluency, am I not correct in saying this? Needless to say, for folks like us who are in a constant pursuit for improvement of our English, it just isn’t good enough to stay at the same level of English for the rest of our lives. Our standards are rising all the time, we want to be able to speak more fluently, more native-like, so what was deemed a good level of spoken English a year ago, for example, just doesn’t cut it for me or you today! Are you telling me Robby that I absolutely require regular spoken English practice even when I’ve achieved a very decent level of spoken English? Your ability to speak in English is a VERY PRACTICAL SKILL; it’s almost the same as your ability to perform physical tasks. You may be a very able athlete, but if you don’t work out for a full year, let’s say, your ability to perform in terms of sports is going to drop significantly and you’ll go back to where you were 5 years ago. Same goes with your English speech. Imagine what would happen if you didn’t speak for a full year? I guess I don’t have to be telling you that it would indeed have a detrimental effect on your fluency and while your comprehension would still stay the same, your ability to use the various means of expression would decline big time. It’s happened to my Russian, by the way. I haven’t used the language for a long time, and now that I get the odd opportunity to speak with Russian speakers, I struggle big time which is a clear indicator of my active vocabulary having reduced over the years. If you want to keep your English fluency SHARP and constantly improving, you should definitely do regular spoken practice sessions with yourself in order to try out and learn new means of expression! I agree with you Robby that practising English on one’s own can be quite effective for developing one’s speaking, reading, listening and vocabulary skills. Would it not be helpful for learners of English to select ready made materials with natural English wording with different levels of difficulty on every topic of communication to practise English on one’s own? Such English learning materials can include helpful thematic dialogues, practically useful texts on each topic for potential practical use of learners, separate sentences with colloquial thematic set phrases and expressions (idioms). Multiple reading and listening to samples of such conversational materials followed by retelling or reproduction or imitation of English dialogues and narrative texts/stories based on one’s needs can result in substantial improvement of one’s English skills. Can I ask you a question, Chris, if you don’t mind? Are you a native or a non-native English speaker? 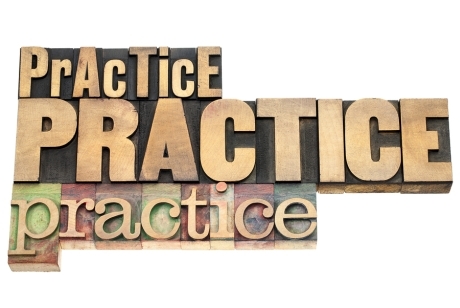 I honestly think that practicing with yourself is a waste of time… at least, compared to practicing with others. Just talk to more people, mingle with more diverse folks, listen to more audiobooks while you’re alone, read more books, have more experiences, stuff like that. This should increase your overall capacity as a human being, not a “mere” English speaker. If your career is too static to allow you that, then maybe you should find a new career. As Jim Rohn said, number one principle of good communication is – have something good to say, and this comes from experience and knowledge. How you say it is important, but nonetheless – secondary, always secondary.